SIGN UP AS EXHIBITOR ? Do you wish to be a speaker at a dental congress ? 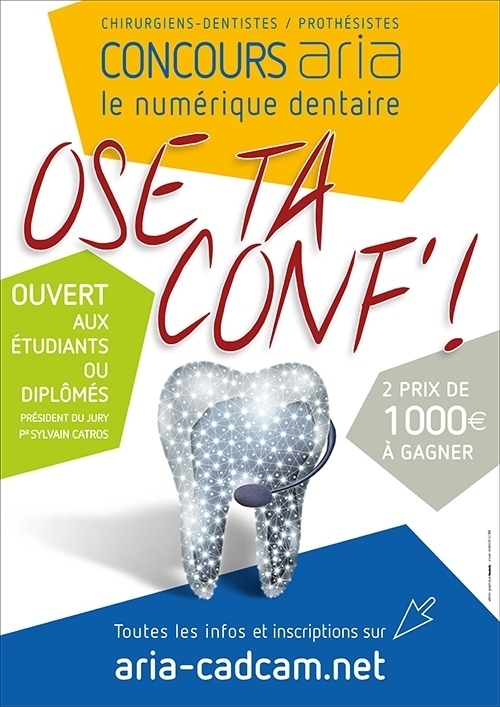 So don’t wait any longer, the challenge “Ose ta conf’ !” is waiting for you! The ARIA committee offers you a speaking time during these 7th meetings on digital dentistry. Who is the challenge open to ? To all students and graduates (dental surgeon and dental technicians), without age limit, who wish to present a clinical case to a professional audience. What is the topic? Let us discover your vision of digital dentistry in your profession ! What are the evaluation criteria ? Are you dynamic ? Do you have imagination and know how to be original ? Do you have the ability to “say well”, to affect and to persuade ? Then you answer positively to the jury’s evaluation criteria ! How does it work ? Send us before July 1st 2019 the communication media of your choice in which you present, alone with your team, your clinical case. To know how to send us your presentation, it’s here! The finalists will be informed by July 15th at the latest and will have to present their work during an exceptional session at the heart of the exhibition, on Thursday 3rd October 2019 morning. The jury will reward the two best speakers according to the criteria mentioned above; they will each receive a prize of 1000€. So, motivated?! Ose ta conf’ !